Cold Water Bacteria Accelerates the decomposition of leaves and other organic matter during the fall and winter months. Will also jump start your pond to a healthier environment in the spring. Microbe-Lift Autumn/Winter Prep helps accelerate the decomposition of leaves, sediment and other organic matter during the fall and winter months. It will also jump start your pond to a healthier environment in the spring. 80 - 200 4 oz. 2 oz. 2 oz. 201 - 500 6 oz. 3 oz. 3 oz. 501 - 1,000 8 oz. 4 oz. 4 oz. 1,001 - 2,500 12 oz. 6 oz. 6 oz. 2501 - 5000 16 oz. 8 oz. 8 oz. 5001 - 7500 20 oz. 10 oz. 10 oz. 7501 - 10,000 24 oz. 12 oz. 12 oz. 10,001 - 25,000 48 oz. 20 oz. 20 oz. 25,001 - 50,000 64 oz. 40 oz. 40 oz. 50,001 - 100,000 1 gal. 60 oz. 60 oz. 100,001 - 300,000 2 gal. 96 oz. 96 oz. The UltraClear Winter Blend is specifically formulated for fall-winter-spring treatment of your pond. Its probiotic formulation of select beneficial bacteria ensures your pond has the required bacteria to maintain a clean pond & healthy fish during the colder months. Start using when water temperature falls below 55 °F. Use in ponds with water temperature down to 35 F.
Reduces Ionized Ammonia & toxic Un-Ionized Ammonia. Reduces build-up of material from decayed aquatic vegetation, leaves, grass, excess food & fish waste. Provides ongoing biological activity as water cools down. Safe for fish, all aquatic life, wildlife & pets. DOSAGE: Use 1 oz per 1000 gallons weekly beginning when water temperature drops below 55 degrees F. Double dosage if pond has an excess accumulation of organic debris. Aquascape Cold Water Beneficial Bacteria contains 7 pure strains of concentrated beneficial bacteria that work quickly cleaning and balancing your water garden. This Cold Water Beneficial Bacteria works at temperatures below 50F or 10C. Water gardens are enclosed ecosystems, which sometimes factors like fish load, uneaten fish food, organics such as leaves, sludge and unwanted debris may disrupt the balance. Aquascape Cold Water Beneficial Bacteria contains a specific combination of bacteria that are most effective at doing two jobs- reducing organic material such as leaves and pond sludge and reducing ammonia, nitrite and excess nutrients such as phosphate that are known to cause poor water quality and unsightly water conditions. 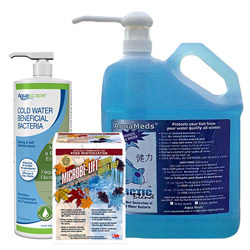 100% Natural Winter Pond Care Bacteria that thrives in cold water temperature! Protect your fish from poor water quality throughout the winter season. Prevents poor winter water conditions, losses and stresses that can cause spring pathogenic outbreaks. Just one easy treatment every other week and your pond and fish will be in perfect condition come spring! Question 1: How does Arctic Blend’s beneficial bacteria remove ammonia from frigid winter pond water when it’s a known fact that “nitrifying bacteria” which keeps ammonia and nitrites at zero does not perform in cold water? Answer 1: Arctic Blend is not a “nitrifying bacteria”. Arctic Blend’s beneficial bacteria is formulated with billions of natural unique microbes that absorb the ammonia from your winter fish pond water. Then these microbes process the ammonia through their system, rendering the ammonia harmless to your fish. You never have the common “nitrifying bacteria nitrogen cycle” which is, high ammonia then high nitrites and at last, less toxic nitrates when using Arctic Blend. Question 2: Why should I worry about the ammonia in the winter months, my fish are not eating so they do not produce waste. No waste, no ammonia? Answer 2: Your fish produce more ammonia by breathing than they do from their waste. So they are producing deadly ammonia all winter.